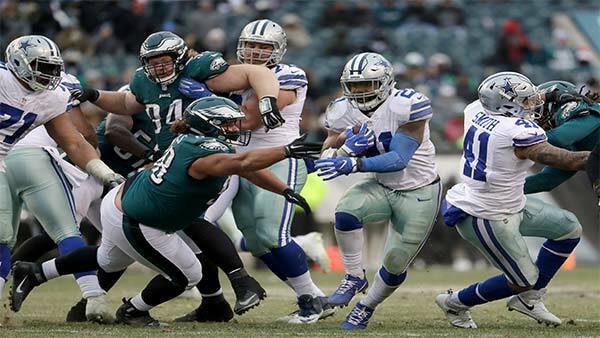 PHILADELPHIA (WPVI) -- Dak Prescott tossed a 20-yard touchdown pass to Brice Butler early in the fourth quarter and the Dallas Cowboys beat playoff-bound Philadelphia 6-0 on Sunday, preventing the Eagles from a franchise-record 14th win. The Eagles (13-3) rested several starters on a frigid day and played others briefly after securing the NFC's No. 1 seed last week. They'll host a playoff game on Jan. 13 or 14. Philadelphia has two weeks to work on its slumping offense. Second-year pro Nate Sudfeld replaced Foles in his first career game. He was tackled inside the 5 after catching a lateral on a desperation play to end the game. Ezekiel Elliott ran for 103 yards, falling 17 short of 1,000 in only 10 games. He was the first player to reach 100 against the Eagles since Washington's Matt Jones ran for 135 yards in Week 6 last year. On the ensuing possession, Dannell Ellerbe stopped Elliott on fourth-and-1 at the 42.